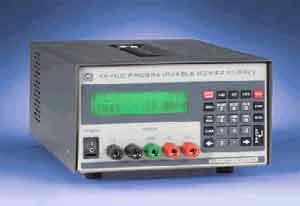 Kepco¹s ABC bench power supply embodies the latest features: keyboard data entry, interactive digital display, integral GPIB support, software calibration, high frequency switch mode conversion, wide range input (85-264V a-c) and power factor correction. It meets the EN 61000-3-2 harmonic limits. A built-in EN 55022 Class B input EMI filter is provided. Integral External Trigger and RS 232 ports are now standard features. Six different models are available from 0-10V at 10A to 0-125V at 1A. 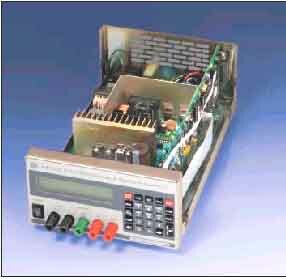 The built-in GPIB and RS 232 interfaces allow ABC to integrate easily into a test system. The ABC is shipped with an instrumentation software driver using VISA (Virtual Instrumentation Software Architecture) I/O to facilitate integration. ABC are CE Marked per the LVD, EMC and RoHS 2 Directives. See applicable Declaration of Conformity. Although the software drivers supplied by Kepco are VISA compliant, they also require the installation of the proper 16-bit VISA driver from your GPIB card supplier. Many vendors supply this software with the hardware; National Instruments (https://www.natinst.com) has the driver for their cards available on the internet at a file transfer site (ftp://ftp.natinst.com — find the folder for suppport and VISA drivers). The driver to be installed is the win16 driver, even if your system is running under Windows 95 or Windows NT. Two rack adapters are available for mounting the ABC in standard 19 inch racks. The RA 71 accepts one ABC power supply; the RA 72 accepts two ABC power supplies side by side. View video showing the use of ABC in a USB Tester Application conducted at QTM (Queens Tech Meetup) - ABC/USB Tester segment at starts at about 16:50.